Last weekend I tried out the new Surface Book. It was presented on the Microsoft Hardware Event which is now about one month ago. Now I want to share my impressions on this beautiful piece of hardware with you. I have collected them in a short period of time so I can’t give information about stuff like battery life etc..
All people who like the design of the Surface Pro 3 or 4 will also like the design of the Surface Book. For all other people I can say that the Surface Book has a very beautiful design and that it also feels pretty good especially with its nice magnesium alloy. 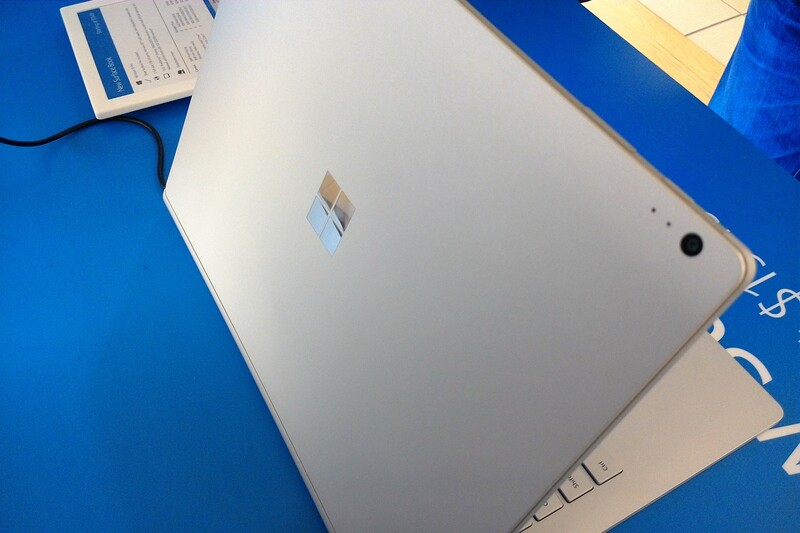 The back side looks a bit like the one of a MacBook besides the Microsoft logo of course! The build quality of the device is very good. The hinge of the device is working very good and it gives the design of the device a special element. After using the device as a laptop I used the device as a tablet and then I docked it with the keyboard again. This worked better and faster than I thought! By the way: When you use the device as a tablet it is incredible thin and light! The device itself neither is the lightest device I have ever used nor it is the heaviest one. The device has a good weight. The Surface Book has an amazing display and with the resolution of 3000 x 2000 pixels it is incredibly sharp and you won’t notice any single pixel. The display shows colors were nice and vibrant. I think that everyone will be very satisfied with this screen. The keyboard of the Surface Book feels and looks pretty good but I’m a bit unsure whether I like the keyboard of the Surface Book or not. The problem is that I’m used to type on the Type Cover of the Surface 3 so it is difficult to switch to a real keyboard. I think that the Surface Book has a good keyboard for typing a lot but it is a matter of getting used to it. The Surface Book is an amazing device and it was a nice experience using it. I like the design and the hardware but I’m not so sure about the keyboard. I think for people who need a powerful laptop but want to use it as a tablet as well sometimes, the Surface Book is the perfect device. I’m really interested in when the first OEMs are going to build devices like the Surface Book. Will it take 3 years again like it took the OEMs to “copy” the Surface Pro? What do you think? Write your opinion into the comments!